--- from "All Shook Up" written by Otis Blackwell and EIvis Presley. The season has brought us two smart, small musicals, Altar Boyz and The Twenty-Fifth Annual Putnam County Spelling Bee, the latter successful enough to transfer from Off-Broadway to Broadway (review, review). But until someone comes along to write a brand-new score for a big show that gets us "all shook up" with dance-along rhythms and sing-along lyrics, the catalogue or juke box musical will be with us on Broadway as well as the West End (We Will Rock You). Good Vibrations' is an example of this genre at its nadir. On a more positive note, All Shook Up demonstrates that such musical tributes can be clever and enormous fun. It remains to be seen whether this Elvis Presley musical can rival the super-international hit status of the similarly structured ABBA tribute, Mamma Mia! or the long running Billy Joel songsical/dansical, Movin' Out. What's certain is that All Shook Up does have enough of the right stuff to be a crowd pleaser. Cheyenne Jackson and some of the ensemble get all shook up singing and dancing "Jailhouse Rock"
Joe DiPietro, best known for the box office record breaking I Love You You're Perfect, Now Change, has created a tongue-in-cheek fairy tale kitschfest that borrows literally from impeccably sources like The Music Man and Brigadoon and, most obviously, Shakespeare (think As You Like It and Twelfth Night). 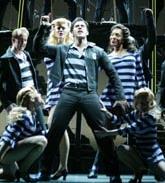 Derivative as it may be, the show accommodates twenty-five of Elvis top songs, effectively arranged by Stephen Oremus. Christopher Ashley's spiffy direction, Ken Roberson and Sergio Trujillo's bouncy choreography showcase a talented, high energy cast. And as the songs keep coming so do David Rockwell's (an apt surname for the designer of a show that really rocks) imaginative sets and props, gorgeously lit by Donald Holder. Costume designer David C. Woolard's rounds out the first class stagecraft with true to the '50s outfits and some terrific ensemble get-ups for the second act's "Jailhouse Rock " scene as well as several wedding gowns that out-do anything bridal wear queen bee Vera Wang could dream up -- and, of course, some blue suede shoes. Those shoes not only introduce the famous song of the same name but work like fairy wings for all the people roaming this Midwestern "forest." It all makes for a show that proves pop soloist or group retrospectives need not be synonymous with musical theater armageddon, provided they're staged and performed with respect for the songs being honored and manage some eye-winking reinterpretation. DiPietro's Prince Charming is Chad (Cheyenne Jackson), a blue-eyed, hip swiveling, guitar strumming roustabout. Chad's bike needs a mechanic's ministrations and so he turns off the highway and lands " in a square little town, in the middle of a square state . . . in the middle of a square decade. " The mechanic turns out to be a girl named Natalie (Jenn Gambatese) who immediately falls madly in love with the tall, dark and handsome stranger -- to the chagrin of her unprepossessing best friend Dennis (Mark Price)) who loves her madly. Once Natalie's wistful "Love Me Tender" sets the tone for the core romance, it's on to a welter of romantic sub-plots. Chad is so blind to Natalie's love that he doesn't even suspect that she's really his Twelfth Night style sidekick Ed. That's because he's smitten with Miss Sandra (Leah Hocking), the gorgeous blonde museum-on-wheels curator; so is Jim, (Jonathan Hadary), Natalie's widowed dad. Jim has his own devoted admirer in Sylvia (Sharon Wilkins), the proprietor of the local saloon (ingeniously decorated with license plates and tires). There's also a romance between Lorraine (Nikki M. James), Sylvia's teen aged daughter and Dean (Curtis Holbrook), the tightly reigned-in son of the tyrannical Mayor Matilda Hyde (Alix Korey), who along with a docile Sheriff Earl (John Jellison) patrols the streets in a Cadillac convertible to keep everyone in the town from having any fun. The vehicular traffic across the stage includes a terrific star-crossed love scene involving one of a mock-Greyhound bus and a bicycle to the tune of "It's Now or Never" is just one show-stopping special effect. Mayor Matilda's outraged "You're the Devil in Disguise" prompted by Chad's disruption of her morality enforcing regime is accompanied by a burst of flames at the the foot of the stage and in the loges. True to it's genre, there's a real juke box to light up every time a song begins. Best of all are the statues in Miss Sandra's museum even though the surprise they entail is as predictable as practically everything else that happens along the way towards the inevitably all's well that ends well ending. What keeps all the balls of the multi-faceted but feather light plot with its frequent self-parodying humor in the air are the Presley songs and the cast. Except for a few collaborative efforts, The King, as he was widely known, relied on other songsmiths like Carl Perkins, Leiber and Stoller, Arthur Crudup and Otis Blackwell (see detailed song credits at the end of the production notes). Even without Elvis to sing them they remain solid gold -- easy on the ears and deliciously danceable. Cheyenne Jackson is as handsome a leading man as you could want. If not quite the iconic royal Elvis was his singing and movementss evoke the Elvis spirit even as he ably handles the goofy bits DiPietro wrote for his character. Jenn Gambatese's is winning as the grease monkey heroine. Mark Price is a good enough performer to overcome the stock aspects of the nerdy Dennis. Lea Hocking's Miss Sandra is the de rigueur blonde bombshell no self-respecting old-fashioned musical can be without; as Sharon Wilkins is Sharon, its big-voiced black Mama. Sharon also happens to love Natalie's widower-dad, an endearing Jonathan Hadary. Seasoned musical veteran Alix Korey has to make do with one big solo, but she makes the most of being obnoxiously officious as Mayor Matilda. The main players are supported by a stellar ensemble that includes several Broadway show veterans like Justin Bohon as well as dancers who've worked with leading ballet companies. While Nikki M. James and Curtis Holbrook give likeable performances as the Barkeep Sylvia's and the Mayor Matilda's children, their interracial romance is too obvious an attempt to mimic Hairspray's message of tolerance. Mr. Ashley and Mr. DiPietro again strain too hard for relevance courtesy of the Bard via Chad's brief sexual confusion. With Spamalot likely to be the season's mega-hit for nostalgia lovers, All Shook Up is probably going to have to satisfy itself being one of the also-rans in terms of the Tony sweeps. However, if Good Vibrations made you leery about any jukebox show, you'll find this one a pleasant surprise. It's like seeing one of Elvis's own movies, but live and in living color. I think if he were alive he'd be in the audience applauding -- though he'd be seventy (really!) and all those pelvic contortions might have him recovering from hip replacement surgery and unable to give a shake, rattle and roll standing ovation. Running time: 2 hours plus 15-minute intermission. Song Credits: "Love Me Tender" by Elvis PresIey and Vela Matson; "Heartbreak Hotel" written by Elvis PresIey, Mae Boron Axton and Tommy Durden; "C'mon Everybody" written by Joy Byers; "Follow That Dream" words by Fred Wise, music by Ben Weisman; "Hound Dog" written by Jerry Leiber and Mike Stoller; "Teddy Bear" written by Kal Mann and Bernie Lowe; "That's All Right" written by Arthur Crudup;"Devil in Disguise" written by Bill Giant, Bernie Baum and Florence Kaye;"It's Now or Never" written by Aaron Schroeder and Wally Gold; "Blue Suede Shoes" written by Carl Perkins; "Don't Be Cruel" written by Otis Blackwell and Elvis PresIcy; "Let Yourself Go" written by Joy Byers;"Can't Help Falling in Love" written by George David Weiss, Hugo Perertti and Luigi Croatore;"All Shook Up" written by Otis Blackwell and EIvis PresIey; "It Hurts Me" written by Joy Byers and Charles E. Daniels; "A Little Less Conversation" written by Mac Davis and Billy Strange; "The Power of My Love" written by Bill Giant, Bernie Baum and Florence Kayo; . "1 Don't Want To" words by Janice Torre, music by Fred Spielman; "Jailhouse Rock" written by Jerry Leiber and Mike Stoller; "There's Always Me" written by Don Robertson; "If 1 Can Dream" written by W. Earl Brown; "Fools Fall in Love" written by Jerry Leiber and Mike Stoller; "Burning Love" written by Dennis Linde. I Don't Want To. Chad.